The Conservative Party have selected an Islamist leader with links to George Galloway as a local election candidate in the London borough of Newham. Mufti Shah Sadruddin has no known previous links to the party, but has been an enthusiastic supporter of Respect MP George Galloway. The Express reports that the Conservative Party have also selected another two candidates in the borough who previously stood for the hard-left Respect Party. Mr Sadruddin has used his Facebook page to urge Muslims to vote for whichever party stands the best chance of ousting the borough’s directly-elected mayor Sir Robin Wales. Anonymous leaflets have also been circulating throughout the borough listing Muslim candidates people should vote for, regardless of party affiliation. Incumbent mayor, Labour’s Sir Robin Wales, has opposed plans for a “mega mosque” project, known as the London Markaz, to be built near the former Olympic site, saying that it is too big. The current mosque site has space for 2,500 worshippers, but the owners have applied to build an extension that would make it one of the largest in Europe. Newham Council rejected the plans, however, and then asked the owners to demolish the existing mosque and clear the site. There are now fears that hard line Islamists are infiltrating the Conservatives as a “party of convenience” as they are best placed to oust Labour in the borough. 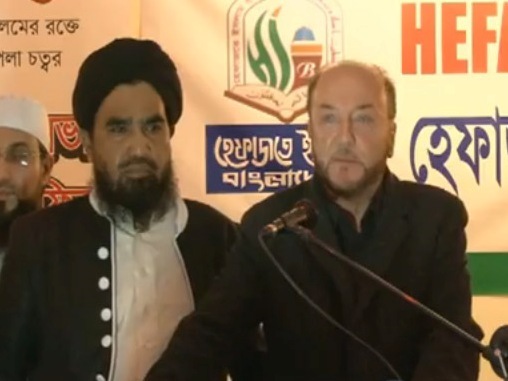 The Express says that Mr Sadruddin can be seen in various YouTube videos rapturously applauding George Galloway, calling for non-violent revolution in the spirit of Tahrir Square, and lamenting the lack of a single Muslim political identity. He also claims that it is easier to persecute Muslims than gays and Jews because Jews “have their anti-Semitism, they have this holocaust” and “gays got these gay rights”. Conservative HQ told Breitbart London that the issue was a matter for the local party. Yesterday, the Conservatives also suspended a candidate in Tower Hamlets following questions over his “historical financial circumstances”. Jewell Islam was arrested on Tuesday over alleged dodgy business dealings, but as the council have already accepted his nomination, his name will still appear on ballot papers.